紹介するのはICLR2017で発表された [1612.07182] Multi-Agent Cooperation and the Emergence of (Natural) Language です. この研究分野は, Google DeepMindやFacebook AI Research 等多くの研究所や大学がここ数ヶ月立て続けにマルチエージェントによる記号創発?の研究成果を発表しています. 『Distillation as a Defense to Adversarial Perturbations against Deep Neural Networks』(https://arxiv.org/abs/1511.04508)という論文を知りました. Deep Neural Networkは意図的に作られた摂動(Adversarial Perturbation)を用いて作られた画像(→Adversarial Sample/Adversarial Examples)に対して脆弱性がある. この投稿は Deep Learning Advent Calendar 2016 - Adventar 13日目の記事です. The second property is concerned with the stability of neural networks with respect to small perturbations to their inputs. Consider a state-of-the-art deep neural network that generalizes well on an object recognition task. We expect such network to be robust to small perturbations of its input, because small perturbation cannot change the object category of an image. However, we find that applying an imperceptible non-random perturbation to a test image, it is possible to arbitrarily change the network’s prediction (see figure 5). These perturbations are found by optimizing the input to maximize the prediction error.We term the so perturbed examples “adversarial examples”. 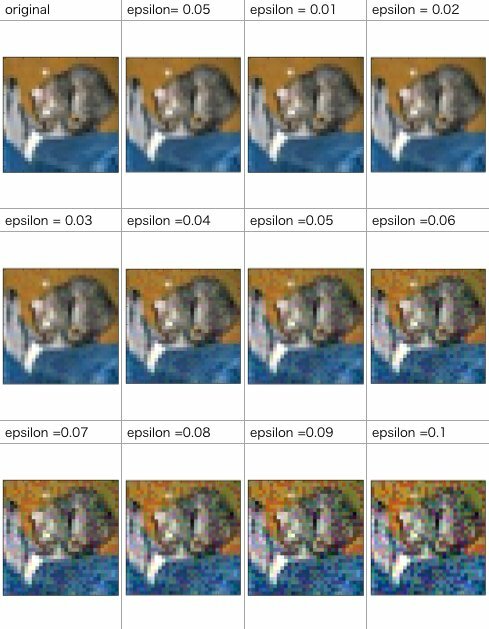 pertubation tableの導出式が多少異なるが[1412.6572] Explaining and Harnessing Adversarial Examples とほぼ同じである. 論文の手法では識別関数の騙したいラベルの出力値のみを用いて元画像の各画素ごとに微分してる.